Scott Milne, Peter Hirschfeld and Sen. Patrick Leahy prepared for a Vermont Public Radio debate Wednesday in Colchester. 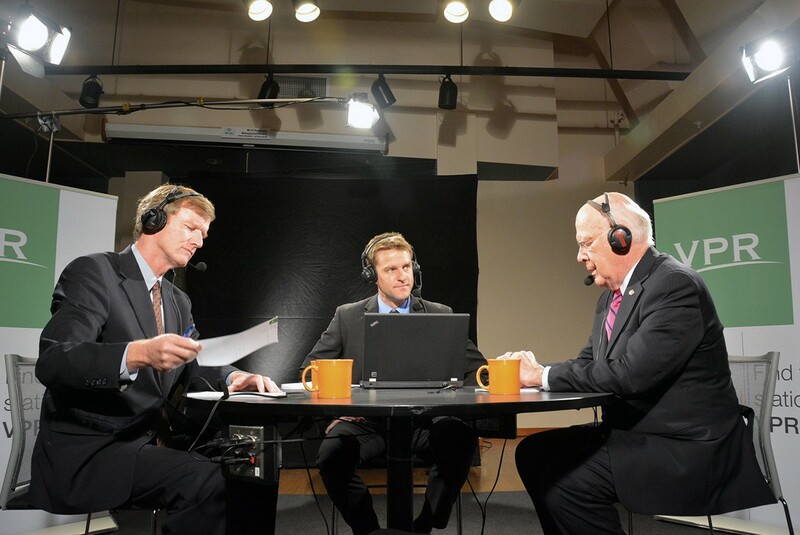 Republican Senate candidate Scott Milne's voice was dripping with sarcasm Wednesday afternoon as he prepared to pose a question to his rival, Sen. Patrick Leahy (D-Vt.), at Vermont Public Radio's Colchester studios. "Sen. Leahy, thanks again for agreeing to our first debate, five days before the election," Milne said, noting that the New Hampshire Senate and Vermont gubernatorial races had each featured more than a dozen such forums. "So, uh, thanks for really stepping up and giving Vermonters a chance to understand what the differences are between the two of us." In fact, the VPR debate was their third of the campaign season, though it was their first — and last — one-on-one encounter. Judging by its bitter tone, neither candidate seemed happy to be there — or with one another. "You've admitted that you've taken, I think, about $20,000 of travel from special interests to places like Las Vegas and Paris," Milne continued, asking whether Leahy felt "uncomfortable" having accepted free airfare and accommodations. The incumbent Democrat said he'd cleared his 2004 trip to Paris — sponsored by the Center for Strategic and International Studies — with the Senate Ethics Committee and later worked with then-senator Barack Obama to enact "very strong restrictions" on free travel. When Milne asked whether he'd accepted a free ride from those involved with the controversial EB-5 investor visa program, Leahy turned the question around on him. "I don't know how you traveled when you and [former governor Jim] Douglas were traveling around Asia," Leahy said, referring to an October 2009 trip to China and South Korea, during which Milne explored taking part in the program. "I assume you paid your own way on EB-5." "We traveled on the bus most of the time," Milne said. "That's a long trip to Asia," Leahy shot back. "I give you great credit for that. There, I will agree with you. You're a man of stamina to be able to take a bus to Asia." Wednesday's debate was filled with such exchanges. Milne, whose entire campaign has consisted of accusations against Leahy, did not let up. If anything, his tone grew harsher and his interruptions more frequent. Leahy, for his part, seemed eager to fight back. When it was his turn to ask a question of Milne, he set the same sort of trap that recently snared Libertarian presidential candidate Gary Johnson. "Mr. Milne, you said at one of our debates ... one of the committees you'd want to be on is Foreign Relations," Leahy said. "Can you tell me three foreign leaders that you admire or respect?" Milne, in fact, could not. After some stalling, the Pomfret Republican said, "I think Merkel's good," referring to German Chancellor Angela Merkel. "I think it's interesting to study what's happening with Merkel in Germany right now." "Obviously the, you know, the new leaders in Great Britain have got a lot of problems going on with 'Brexit,'" he continued, presumably referring to Prime Minister Theresa May. "It'll be interesting to see what's gonna happen with them." Then Milne really got stuck. "Um. You know, I think, you know, the current Russian leader, I think you were correct in that, I think, in that same debate when you said either by mismanagement of the United States foreign policy or by just the way things work out, we're on the eve of another cold war," he said — this time referring to Russian President Vladimir Putin." So Putin's clearly not somebody to admire, but he's somebody we need to really pay attention to, and its something I think I have the right temperament and the right foundation to be able to bring a contribution." Just to show off, Leahy decided to answer his own question, saying he'd pick Canadian Prime Minister Justin Trudeau, Colombian President Juan Manuel Santos and Pope Francis, who technically rules the Vatican City. If Wednesday's debate featured plenty of sniping, it included relatively little substance. Throughout the campaign, Leahy has criticized Milne for failing to offer policy proposals beyond those related to his attacks on the incumbent: namely, campaign finance reform and term limits. But Leahy himself has done little to explain what legislation he'd seek to pass if elected to an eighth six-year term. Asked by debate moderator Peter Hirschfeld what "specific policy initiatives" he hoped to accomplish "in the next six years," Leahy instead highlighted successes from his past. "Instead of just going on a negative campaign saying everything I'm against, I can talk about things I've done and I'm for: legislation we passed. For example, the Violence Against Women Act, which I wrote and greatly expanded," the senator said. "I showed that we could pass a major immigration bill through the Senate. It was blocked by members of Mr. Milne's party in the House. I would like to go back and do that again." Finally, Leahy said, he would "continue and protect legislation, not that I've talked about, but that I've written. For or example, the organic farm bill, which I wrote and is now, a lot of farmers in Vermont rely on it." Milne didn't fare much better. When Hirschfeld asked him to explain what he would do in the Senate to improve Vermonters' economic lot, Milne mustered up a meandering answer about the power of special interests in Washington, D.C., and the growing federal deficit. "Specific legislation that you would introduce that would get us there?" Hirschfeld prompted. "Term limits and campaign finance reform," Milne said.